I’ve been in the grip of Ferrante Fever since 2013, have read all Ferrante’s novels at least three times and have written a book, “In Search of Elena Ferrante,” to help me better understand why these books have had such a hold on my imagination and on the imaginations of millions of readers worldwide. Given this history, I expected to be hypercritical of the new film version “My Brilliant Friend” on HBO, but loved it and am eagerly looking forward to season 2. Ferrante’s Neapolitan novels trace the lifelong friendship of Elena Greco and Lila Cerullo, born a month apart in a working-class neighborhood in Naples in 1944. The film begins with Lila’s disappearance and Elena’s attempt to recapture her friend by recording everything she can remember. The film is faithful to the novel although (except for the occasional voiceover) we do not have Elena’s narrative voice, her complicated, often contradictory thoughts, or her deeply felt but sometimes barely understood emotions. Although the HBO series is a successful adaptation, it has not shaken my belief that great novelists, and I include Ferrante in this category, provide access to the interior lives of fictional characters in a way film cannot. Ferrante’s Neapolitan Quartet reminds us of what only literature can do. In the novel, Ferrante writes that Elena admitted that in some hidden part of herself she looked forward to attending a school where Lila would never enter, where without competition from Lila she would be the best student, and that she might sometimes tell Lila about her experiences, boasting about her success. 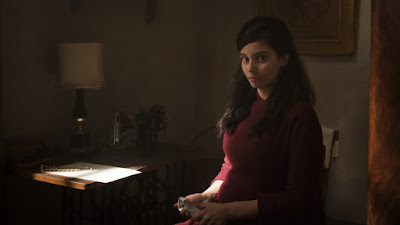 Elena’s complicated feelings about her friend and rival do not fully emerge in the film — in part due to the difficulties of finding visual equivalents for conflicting emotions, and possibly also because the screenwriters did not want to delve too deeply into the dark side of Elena, assuming that the television audience would want a more likeable Elena than we have in the novel. There are other indications that the screenwriters wanted to make Elena a more consistently likeable character. Elena is capable of callousness such as her treatment of her first boyfriend Antonio, whom she uses and disposes of with casual cruelty. In the novel Elena takes the initiative and asks Antonio to accompany her to Lila’s wedding — “not to leave me alone, and maybe always to dance with me.” Antonio interpreted the invitation as evidence of Elena’s serious interest in him; he went into debt to buy a new suit for the wedding, an expenditure he could ill afford. In the film, it is Antonio who takes the initiative and asks Elena if he can accompany her. Perhaps the screenwriters wanted to downplay the extent to which Elena was responsible for using Antonio. At the wedding she appeared oblivious to his feelings, humiliating him by ignoring him at the wedding reception, instead spending time with the young man she really loved, Nino Sarratore. Although Ferrante’s Neapolitan Quartet is generally thought to be about men’s mistreatment of women, the roles are sometimes reversed, with Elena callously using Antonio. The film does not portray the complexity of Elena’s inner life, but almost in compensation gives us a more vivid portrait of Lila. I found the film version of an increasingly desperate Lila resisting Marcello Solara’s advances more powerful than the corresponding section in the book, where everything we see of Lila is refracted through Elena’s memory. Although the voiceover from time to time reminds us we are witnessing the recollections of Elena, a mature woman, in the film we see Lila as a character in her own right, with a greater force and immediacy than in the novel. In response to a Guardian interviewer who asked Ferrante if she would ever be tempted to let Lila tell her own story, Ferrante insisted that the Quartet “can only be Elena’s tale: outside that tale [Lila] would probably be unable to define herself.” In the film Lila does exist outside Elena’s tale, and in Gaia Girace’s haunting performance, the teenage Lila dominates the film. In the film, the power of facial expressions often compensates for the lack of Elena’s narration. In the scene in the novel where the Solaras harassed Elena and Lila, Marcello Solara recovered Elena’s bracelet, which had broken when she pulled away from him. He looked not at Elena but at Lila, suggesting his interest in Lila: “It was to her that he said, ‘I’m sorry.’” In the film we also see the play of complicated emotions as Marcello stares at Lila holding a knife to his throat: fear, fascination, sexual attraction. The soundtrack reinforces the sense that we are looking at a man who is beginning to fall in love. Also, thanks to her wonderfully expressive face, Dora Romano’s Maestra Oliviero emerges as a far more interesting character than Elena perceives. In the novel Maestra Oliviero sometimes verges close to caricature. However, Romano creates a complex, sometimes sympathetic character passionately devoted to those few students she believes have exceptional promise and no doubt doing incalculable damage to those she dismisses as dunces. She recognizes Lila’s genius and is devastated that Lila cannot continue her education. There is one powerful scene with Maestra Oliviero that is not in the book. She delivers a feminist rallying cry urging the girls in her class to seize opportunity to do better than the boys. Granted this is implicit in Ferrante’s account: “Maestra Oliviero especially enjoyed taking us to classes where the girl students and women teachers could not be humiliated so much as the males.” I enjoyed the screenwriters’ choice to turn this into a feminist pep talk. Another area where film may have an advantage is the creation of a social world. 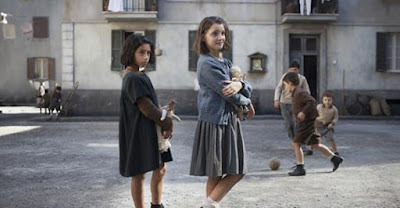 Critics have generally praised the authenticity of the sets noting that the Italian producers had painstakingly recreated the neighborhood in a 20,000-square-meter set in Caserta, a town near Naples. Certainly the all-pervasive violence has a greater impact in a film. Seeing someone savagely beaten has a greater immediacy and power than a verbal description of violence. Much of the action is driven by the endless cycle of violence: a consequence of the male characters’ insatiable need to avenge every insult. Stefano Carracci, the prosperous grocer Lila marries, surprises everyone by inviting the Pelusos, the family of the man he believes murdered his father, to his New Year’s Eve party, thereby rejecting the revenge ethic so deeply ingrained in the culture of the neighborhood. I found the scene in the film, with old enemies gathered at the house of the Carracci family to celebrate the New Year together, far more moving than the corresponding scene in the novel. Ensemble scenes such as the New Year’s Eve party were generally more effective in the film. This was certainly the case with the New Year’s Eve battle, waged by the young men of the neighborhood, armed with firecrackers and explosives. One ancient quarrel had been resolved, but another was burning brightly. Stefano Carracci and his former enemy Pasquale Peluso were on one side and the Solaras and their allies on the other. The scene is beautifully choreographed ending when the brutal Solaras, angry at being outdone by Carracci and his new allies, started firing real bullets. The wedding scene is the ultimate ensemble piece in the film. Elena experiences the wedding as a turning point in her relationship with Lila and also as a measure of her estrangement from the world of the neighborhood. Elena had become acutely aware of her alienation from the boys she had grown up with. She was accustomed to their violent behavior and rough language, but as she advanced from middle school to high school, she followed a path completely unknown to them. Both Elena and her mother had assimilated Maestra Oliviero’s message that Elena should keep her distance from these young men. At Lila’s wedding reception, Elena’s mother insisted that she stay away from Antonio, a neighborhood boy who had fallen in love with her, telling her daughter that her parents were not paying for her education in order to have her fall in love with a mere auto mechanic. The wedding reception filled Elea with horror. She recalled when Maestra Oliviero asked her if she knew what “the plebs” were and she now understood what she hadn’t fully grasped years ago: “The plebs were us.” In the novel Elena elaborates: “The plebs were that fight for food and wine, that quarrel over who should be served first and better, that dirty floor on which the waiters clattered back and forth, those increasingly vulgar toasts The plebs were my mother, who had drunk wine and now was leaning against my father’s shoulder, while he, serious, laughed, his mouth gaping, at the sexual allusions of the metal dealer.” Elena had internalized much of Maestra Oliviero’s class prejudice and now saw her family and friends through Maestra Oliviero’s eyes. Although Elena views the wedding guests with horror, the viewer sees what Elena misses–the vitality and capacity for enjoyment that characterizes Neapolitan working class life. It’s not all gloom and violence. Film cannot so easily simultaneously portray the drama of the wedding and Elena’s ruminations about what the wedding means to her. The film has added to my appreciation of the novel; however, I have one major complaint. I found middle-aged Donato Sarratore’s sexual assault of 15-year-old Elena during a summer vacation in Ischia more disturbing in the film than in the novel. Elena is taken by surprise by Donato, did not resist him, and appears immobilized. The film’s soundtrack, more appropriate to a romantic scene than to a sexual assault, is jarring. For Elena, the experience was a mixture of repulsion and the stirring of sexual desire. Confused and ashamed, Elena flees the island early in the morning the next day; she told no one about the experience. I think Costanzo’s concern for the viewer is misplaced here. The soundtrack has the impact of minimizing the reality of sexual assault. There has been much discussion of which version is better, the book or the film, but that may be the wrong question. Each version provides different pleasures and insights, taking full advantage of the resources of fiction or of film. Mt. Airy resident Karen Bojar is a regular contributor to the Local. Her book “In Search of Elena Ferrante” is available on Amazon. This episode is a powerful portrayal of Lila’s story. Her courage and self-possession can make the viewer easily forget she is only sixteen years old. We see her growing anxiety about her engagement to Stefano, her increasing awareness that she is about to foreclose options in life through an early marriage, and on the day of her wedding, her realization that she had made a terrible mistake. The episode is less successful with Elena’s story, revealing the limitations of film which cannot easily simultaneously portray the drama of the wedding and Elena’s ruminations about what the wedding means to her. Elena experiences the wedding as a turning point in her relationship with Lila and also as a measure of her estrangement from the world of the neighborhood. Elena had become acutely aware of her alienation from the boys of the neighborhood. She had grown up with them, was accustomed to their violent behavior and rough language, but as she advanced from middle school to high school, she had been following every day a path completely unknown to them. Elena’s mother had assimilated Maestra Oliviero’s message that Elena should keep her distance from these young men. At Lila’s wedding reception, Elena’s mother insisted that she stay away from Antonio, a neighborhood boy who had fallen in love with her, telling her daughter that her parents were not paying for her education in order to have her fall in love with a mere auto mechanic. In the novel Elena took the initiative and asked Antonio to accompany her to Lila’s wedding—“not to leave me alone, and maybe always to dance with me.” Antonio interpreted the invitation as evidence of Elena’s serious interest in him; he went into debt to buy a new suit for the wedding—an expenditure he could ill afford. In the film it is Antonio who takes the initiative and asks Elena if he can accompany her. Perhaps the screenwriters wanted to downplay the extent to which Elena was responsible for using Antonio. At the wedding she appeared oblivious to his feelings, humiliating him by ignoring him at the wedding reception, instead spending time with the young man she really loved—Nino Sarratore. Although Ferrante’s Neapolitan Quartet is generally thought to be about men’s mistreatment of women, the roles are sometimes reversed, with Elena callously using Antonio. The wedding reception filled Elena with horror. She recalled when Maestra Oliviero asked her if she knew what “the plebs” were and she now understood what she hadn’t fully grasped years ago: “The plebs were us.” In the novel she elaborates: “The plebs were that fight for food and wine, that quarrel over who should be served first and better, that dirty floor on which the waiters clattered back and forth, those increasingly vulgar toasts. The plebs were my mother, who had drunk wine and now was leaning against my father’s shoulder, while he, serious, laughed, his mouth gaping, at the sexual allusions of the metal dealer.” Elena had internalized much of Maestra Oliviero’s class prejudice and now saw her family and friends through Maestra Oliviero’s eyes. The film leaves the viewer with unforgettable visual images of the wedding, but the novel presents both the drama of the wedding and Elena’s troubled, complicated reactions. I’m happy to have the experience of both film and novel versions of My Brilliant Friend. Both Elena and Lila get in involved with a man for the wrong reasons. In Lila’s case she becomes engaged to Stefano Caracci, a prosperous grocer, thinking this is her only a way out of an engagement to Marcello Solara. When Lila asked Stefano if he was really different, Stefano replied, that was his intention. However, well aware of the difficulty of breaking with the mores of the neighborhood, he admitted that he didn’t know if he could keep his promise. When Marcello Solara, furious that Lila had chosen Stefano over him, spread obscene rumors about Lila, Stefano and Lila decided to reject revenge and rise above the values of the neighborhood; they would act as if the Solaras did not exist. Stefano did not defend the honor of his fiancée, Lila ignored the slander, and the Solaras continued to spread lies. Elena did not understand what was happening. She found the Solaras’ behavior more comprehensible, more consistent with the world in which they had grown up than Stefano and Lila’s refusal to seek revenge. Desperate to keep pace with Lila who is now engaged to Stefano, Elena becomes involved with a mechanic Antonio Capuccio. The film, like the novel, conveys the frustrations of adolescent sexuality in a sexually repressed culture. Elena felt strong sexual stirrings with her first boyfriend, Antonio, although her reasons for getting involved with him had more to do with her desire to keep up with Lila than for any deep emotional connection she had for Antonio. Elena has affection for Antonio and enjoys their sexual intimacies, but is in love with Nino. Antonio is falling ever more deeply in love with Elena who apparently has no moral qualms about stringing him along. The film—up to this point--tends to portray Elena as “the good girl” and downplays her self-absorption and capacity for cruelty. Elena takes her first trip outside of Naples, with the drab streets of the neighborhood replaced by the brilliant colors of Ischia. My guess is this episode will increase tourism to Ischia. The episode highlights what will become a major theme of the Neapolitan Quartet—the damage done by deceptively charming sexual predators, like Donato Sarratore—totally selfish and unconcerned about the impact of their behavior on the women they seduce. Ironically Nino will surpass his father as an incorrigible womanizer. Since Ferrante gives us no sense of Nino’s interior life we have no insight into his transformation from a young man appalled by his father’s behavior to a far worse womanizer than his father. When Donato learns that Elena is a student at a classical high school, his interest in her picks up. Donato’s wife Lidia notes his interest in Elena and is clearly disturbed by it. Lidia’s reaction is not in the novel where we see only what Elena sees. This is an instance where film has the advantage by conveying through facial expressions, what Elena doesn’t see. Elena is taken by surprise by Donato’s sexual assault, which I found more disturbing in the film than in the novel. Generally, visual images of violence and sexual assault when portrayed in film are more powerful than when described in a novel. Fifteen-year-old Elena did not resist Donato and appears immobilized. The film’s soundtrack, more appropriate to a romantic scene than to a sexual assault—is jarring. For Elena, the experience was a mixture of repulsion and the stirring of sexual desire. Confused and ashamed, Elena flees the island early in the morning the next day; she told no one about the experience. I think Costanzo’s concern for the viewer is misplaced here. The soundtrack has the impact of minimizing the reality of sexual assault. This is the first directorial choice that I found seriously problematic. Elena and Lila’s lives continue to diverge. Elena is venturing out into the wider world while Lila becomes increasingly enmeshed in the world of the neighborhood. Lila’s brother Rino was humiliated by his lack of money and desperate to become economically successful. Consumed by envy of the Solaras, lords of the neighborhood who disrespected him, Rino became obsessed with the idea of becoming rich by opening a factory to make the shoes Lila had designed. When his father rejected the idea, Rino went on a rampage, frightening his mother, other family members and the neighbors. He overturned furniture, broke plates, and swore he would kill himself rather than work in his father’s shoe shop for a pittance. Rino’s response to dashed dreams of upward mobility and to class-based insult was to resort to physical violence. For women, poverty may have severely limited their options but did not diminish their sense of themselves as women; for men, poverty threatened their very identity as men. Rino’s anger and insecurity leads him to attack a young man from one of the wealthy Neapolitan neighborhoods, leading to a vicious beating by the young man’s friends armed with sticks, and then rescued by the Solaras armed with iron bars. Both Lila and Rino were trapped by violence and poverty, but Lila was also facing the threat of marriage to Marcello Solara, scion of the neighborhood’s organized crime family. Her parents saw this marriage as way of improving the economic prospects of the Cerullo family and her father threatened dire consequeences if she refused Marcello. I found the film version of an increasingly desperate Lila resisting Marcello’s advances more powerful than the corresponding section in the book, where everything we see of Lila is refracted through Elena’s memory--her struggle to understand her friendship with Lila and the conflicting emotions she experiences, deep attachment laced with rivalry and jealousy. Although the voiceover from time to time reminds us we are witnessing the recollections of a mature woman, for the most part in the film we see Lila as a character in her own right, with a greater force and immediacy than in the novel. In response to a Guardian interviewer who asked Ferrante if she would ever be tempted to let Lila tell her own story, Ferrante insisted that the Quartet “can only be Elena’s tale: outside that tale [Lila] would probably be unable to define herself.” In the film Lila does exist outside Elena’s tale and in Gaia Girace’s haunting performance dominates the film. Dora Romano’s Maestra Oliviera also exists outside Elena’s tale and emerges as a far more interesting character than Elena perceives. So the bottom-line: the book is not better than the film—nor vice-versa. Each version provides different pleasures and insights.